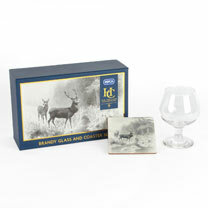 Glass and coaster supplied gift boxed, part of the RSPCA Heritage Collection. Brandy glass 12 x 9 x 9cm. Gift boxed.